This is indeed one of the most interesting clocks you will ever make. People stand in front of it for an unlimited time trying to decide how it runs and how it indicates the time it is keeping. The pivoted vane of the toggle, attached to the pendulum rod about 9" below the suspension spring, initiates the pendulum impulse cycle. Normally, the vane passes freely over the blued trigger of the impulse mechanism. As the pendulum arc decays, the vane eventually fails to pass the trigger and lands in the notch at its top. The next pendulum arc depresses the trigger and unlatches the gravity impulse arm. Its roller rolls down the incline plane of the pallet and impulses the pendulum. As the roller nears the bottom of the incline, silver contacts on its arm and the magnet armature close. The battery energizes the electromagnet, which re-latches the arm. The pendulum then swings freely for about 50 beats until its arc again decays and the cycle repeats. The time indicating mechanism is also quite unusual. 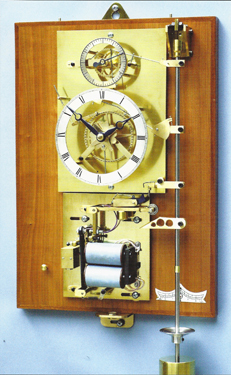 A similar one was used by England’s Dr. Woodward in his string clock to both indicate the time and power the pendulum. These functions are reversed in this clock, so that the time indicator is powered by the pendulum. This inversion required several changes of the Woodward mechanism. The pin wheel gate was abandoned, a pivoted finger added to the pin wheel pawl and a spring loaded detent provided. The latter accelerates the pin wheel to a velocity greater than that imparted by the pendulum. This forces disengagement of the finger after it indexes the pin wheel. A pawl attached to the pendulum rod near the top indexes the ratchet wheel, which makes one revolution per minute in 1-1/2 second steps. One tooth of the wheel is cut deeper than the others. Once each minute the pawl drops into that deep tooth. There it engages a wire lever that is mounted in a pivoted body having a second wire lever. This last lever depresses the pin wheel pawl that has a hinged brass finger at its end. The finger catches one of the 60 pins on the pin wheel and indexes it one step and the minute hand one minute. The clock uses an Aaron Dodd daisy wheel cam mechanism for the 12 t0 1 hour hand ratio. This eliminates the usual motion work gear train and allows the clock to remain gearless. Although i have seen the clock keep time to less than a second per week, i consider it a novelty clock because with its open case dust accumulation on the parts can alter its time keeping ability.